The cut-and-loop design of the stunning Egypt collection creates a relief like effect and will fill your room with elegance and class. The intricate detail in these rugs makes them perfect for traditional space with plenty of features and facets, from elaborate lighting to ornate furniture. 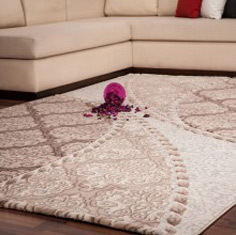 Although these rugs are in our cheap rug collection, this does not mean that they are anything but high-quality, expertly made pieces. They are all woven with single Lurex fibres, creating an eye-catching finish and they are also easy-clean and incredibly durable. The warm and soft shades of beige, brown and cream will create an inviting and cosy atmosphere in any room.